When it comes to sedans, Goshen and Monroe drivers often gravitate towards either the 2016 Honda Civic or the 2016 Hyundai Elantra. It pays to be discerning, so we’ve written a constructive comparison to let you know which one offers superior technology, the most favorable efficiency scores, and the greatest level of comfort. LX: The Civic starts as it means to go on, providing drivers premium equipment such as a multi-angle rearview camera, 5-inch color LCD screen, LED daytime running lights, and electric parking brake. EX: The EX makes a number of upgrades to your driving experience. A remote engine start function allows you to get the car to a comfortable temperature before you even slip inside, a one-touch power moonroof lets you open up your drive, and a handy Honda LaneWatch feature plays on your 7-inch electrostatic touchscreen. EX-T: The EX-T is all about performance. A sporty ride is guaranteed thanks to a turbocharged 1.5L engine, but dual-zone climate control and heated front seats are also included as standard. EX-L: The EX-L does for comfort what the EX-T does for performance. You’ll sink into luxurious leather seats — with an 8-way power adjustment function for the driver — and wrap your hands around a leather-wrapped steering wheel. Touring: Your top of the range Touring includes top of the line technologies, such as an array of Honda Sensing driver assistance, heated outboard rear seats and a 450-watt 10-speaker premium sound system. The 2016 Hyundai Elantra starts with the SE trim, equipping basic features such as 15-inch steel wheels, a height-adjustable driver seat, and a tilt-and-telescoping steering wheel. Models work their way right up to the Sport. It lacks the leather upholstery and automatic climate control system usually included in upper-level trims, though it does come with sport-tuned suspension. The 2016 Honda Civic and the 2016 Hyundai Elantra each provide a choice of two engines, though the Civic manages to conjure up superior ratings in terms of both power and efficiency. Standard Engine: The Civic’s standard 2.0L four-cylinder outperforms the Elantra’s 1.8L by offering 158 hp and 138 lb-ft of torque to the Elantra’s 145 hp and 130 lb-ft of torque. It also allows for up to 31 mpg in the city and 41 mpg on the highway* when paired with a CVT — the Elantra tops out at 28 mpg city and 38 mpg highway. 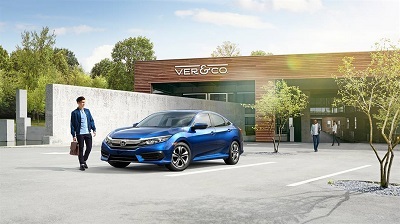 Available Engine: The Civic’s available 1.5L turbocharged four-cylinder roars with a 174 hp and 162 lb-ft of torque output, yet still manages a phenomenal 31 mpg in the city and 42 mpg on the highway* when paired with a CVT. The Elantra’s available 2.0L can’t compete, with a 173 hp and 154 lb-ft of torque and the ability to make up to only 24 mpg in the city and 35 mpg on the highway. The 2016 Honda Civic has been fully redesigned, so the cabin is just as modern and well-appointed as you would expect. 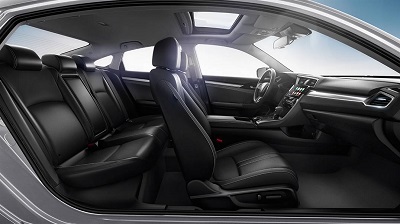 It’s also slightly more spacious than the cabin of the 2016 Hyundai Elantra — the difference between 97.8 cubic feet of passenger space and 95.6 cubic feet is certainly noticeably. The Civic also provides an extra bit of room for your cargo — the trunk measures an impressive 15.1 cubic feet vs. just 14.8 in the Elantra. 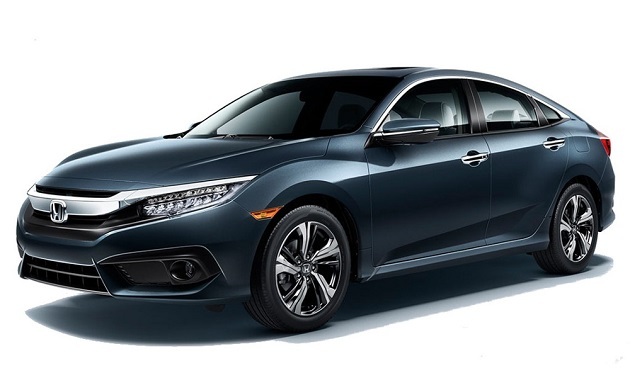 Goshen and Monroe drivers have become used to receiving high standard of onboard technology from the Civic, and the 2016 model will not disappoint. 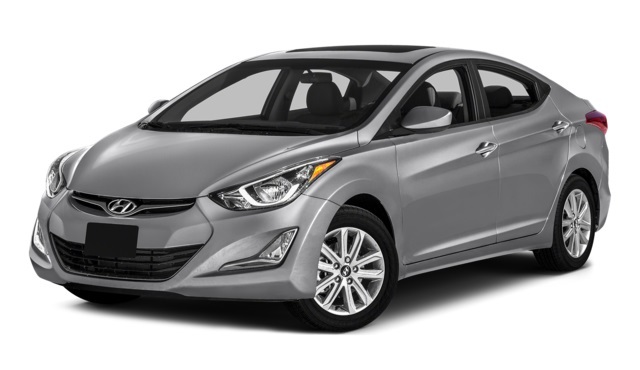 Compare its standard and available features to those of the 2016 Hyundai Elantra, and you’ll be stunned to remember that they rest in the same class. 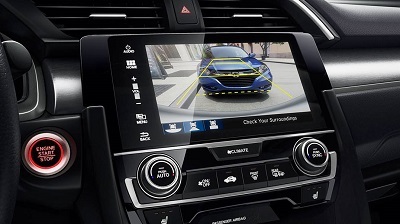 Multi-Angle Rearview Camera: The Elantra doesn’t even include a rearview camera as standard, and the one it does provide can’t offer the three separate viewing angles shown by the Civic’s advanced model. Apple CarPlay®/Android Auto™: One of the Civic’s standout features is its integration of Apple CarPlay® and Android Auto™ connectivity. Drivers will be able to connect their smartphone to the vehicle, then read messages, play music, and use apps on the7-inch display audio touchscreen. Rain-Sensing Windshield Wipers: The Civic is smarter than the average auto, with the ability to sense when it is raining and activate its wipers automatically. 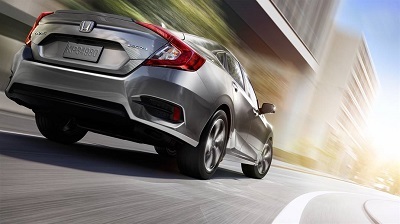 Adaptive Cruise Control: Standard cruise control keeps you at a preset speed; this cutting-edge system will automatically adjust that speed to compensate for the distance between your Civic and the vehicle ahead. Drivers are always impressed by the 2016 Honda Civic, but that goes double when they’ve just driven the 2016 Hyundai Elantra. To test drive this stunning sedan near Goshen and Monroe, don’t hesitate to visit Middletown Honda today.